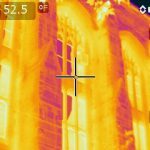 Vertical Access was retained by Durkee, Brown Viveiros & Werenfels Architects to perform an infrared thermography survey of the Wall Street façade of the Sterling Memorial Library on the campus of Yale University. VA’s survey was part of a water testing program designed by Robert Silman Associates to locate the source of ongoing water infiltration. Infrared thermography was utilized to establish moisture patterns, to help the design team locate probe areas, and to inform the ultimate design of repairs. 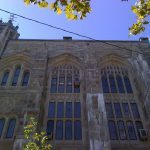 Sterling Memorial Library is a Gothic Revival building designed by James Gamble Rogers and completed in 1930 to house Yale University’s extensive library collection. It is an example of transitional masonry construction: while the interior floors are supported by a steel frame, the exterior wall is load-bearing masonry, with granite and sandstone facing and brick backup. The library is located on the university’s central quadrangle and is one of several buildings designed by Rogers in the Gothic Revival style that is iconic of Yale’s campus. The building is highly ornamented on both the exterior and the interior, featuring works by many notable decorative artists. Determine the source and path of water infiltration during water testing of selected areas of the façade. Confirmed locations of water infiltration using visual observations and thermal imaging. Used a FLIR E60 infrared camera to evaluate the extent and pattern of moisture within the wall materials and determine the source of water infiltration. Frank Capasso and Sons, Inc.